Joy is BowerGroupAsia’s country director for Taiwan. She was born and raised in Taipei, Taiwan. 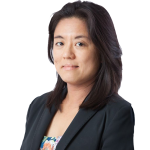 Joy is an experienced journalist and an expert on policy and regulatory developments in Greater China. Prior to joining BGA, she wrote breaking news stories and provided timely analysis from Shanghai and Taipei on such business-relevant regulatory issues as antitrust and anti-corruption enforcement for Dow Jones Newswires. Earlier she covered global financial markets, macroeconomic developments and general business news for Dow Jones Newswires in New York. Her articles frequently appeared in major media like the Wall Street Journal and FT.com, among others. Bilingual in Chinese and English, Joy also reported in Chinese for major Taiwanese business press such as Business Weekly. Joy has a Master of Arts degree in journalism from the University of Southern California, and a Bachelor of Arts degree from the University of California, Los Angeles, majoring in German and political science.